The Area 4 Pharmacotherapy Network (A4PN) is working to improve patient access to pharmacotherapy services in southern and eastern metropolitan Melbourne. Pharmacotherapy is also commonly known as Opioid Replacement Therapy (ORT), Opioid Substitution Therapy (OST) and Medication Assisted Treatment of Opioid Dependence (MATOD). It is an effective evidence-based treatment for opioid dependence, involving the use of buprenorphine/naloxone, buprenorphine or methadone. Opioid dependence is a growing public health concern affecting a wide variety of people, including those who are prescribed opioids for pain and those who take illicit opioids. Recovery and reduction in harms to the individual and wider community are some of the many benefits of pharmacotherapy. A4PN supports health professionals across Victoria to prevent, identify and manage opioid dependence. See our Health Professionals page to find out more about how we can support you. To contact the Area 4 Pharmacotherapy Network, email A4PN@semphn.org.au or call 03 8514 6600. The Area 4 Pharmacotherapy Network (A4PN) is funded by the Department of Health and Human Services. South Eastern Melbourne PHN and Eastern Melbourne PHN are partners leading this initiative. 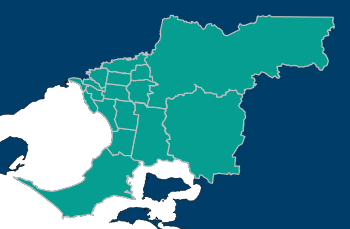 The Area 4 Pharmacotherapy Network (A4PN) is one of five networks established by the Victorian Government in 2014. 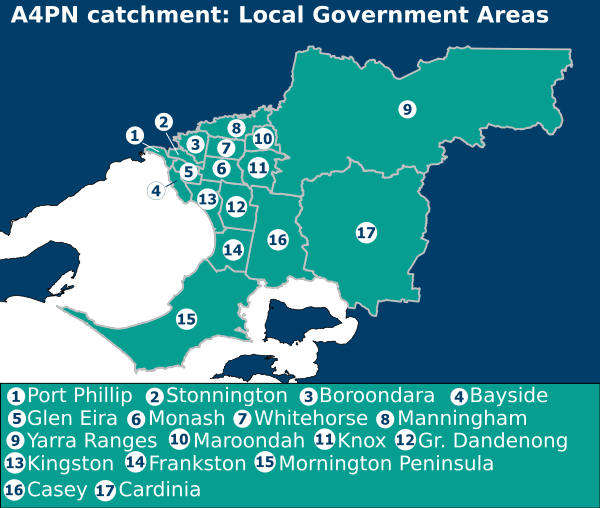 A4PN’s catchment stretches from Port Melbourne to Lang Lang in the south-east, and from Matlock in the Yarra Ranges to Portsea — an area of nearly 6,000km2 with a boundary more than 700km long — encompassing 17 local government areas. Visit www.pabn.org.au for information about other pharmacotherapy networks in Victoria.